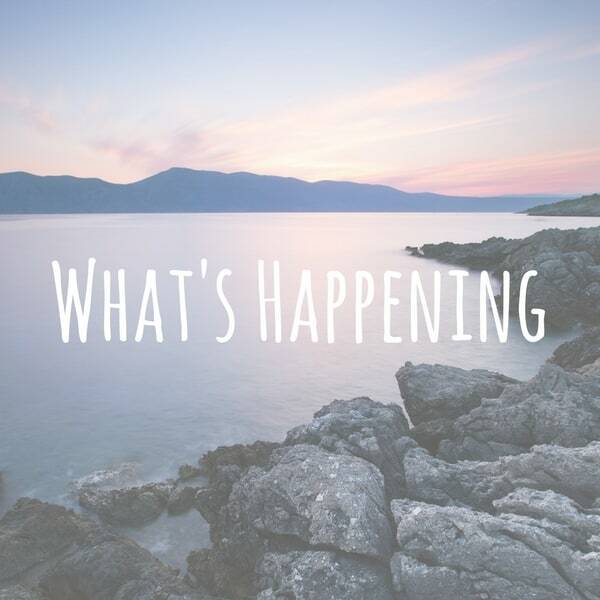 The sixth edition of my What’s Happening series, where you get a sneak peek into what I’ve been up too and what I’m loving when it comes to all things food, natural beauty and more! These posts always sneak up on me and I just can’t believe another month has flown by!! We’ve had a pretty quiet July which mostly involved trying to find a house to move into, and now we’ve found one we are packing! We’re hoping this will be the last move for a long time because over the past 2 years we have moved 4 times! I’m currently exercising procrastination at an Olympic level but I’m sure over the next few days it’ll all come together… At least I hope! Berry Green Smoothie – I’m trying to use up all the ingredients in our fridge and cupboards at the moment which means our meals haven’t been very inventive of late. The smoothies are helping me use up all the frozen fruit and vegetables I’ve been stockpiling. And trust me, this smoothie is delicious (read: doesn’t taste like greens / lawn cuttings). Life Basics Pure Green Clay Mask – I’ve found with some masks that I’ve used that they seem to spur on more breakouts (acne sufferer right here) but I have found this mask to be quite gentle. My skin feels clean and smooth after using it, and it’s very easy to use – just mix a bit of the dried clay with some water and smooth over your face. Ozark – If you have Netflix I highly recommend this new series. The show focuses around a man (Jason Bateman) who has been drawn in to laundering money for a Mexican drug cartel. Laura Linney plays his wife and they both do a sensational job. We binged watched over two days and now feel deflated that there is no more until next season! The Detroiters – This is probably going down as our find of the year. It’s on comedy central and centres around two local ad men who make low budget TV commercials in Detroit. I cry laughed my way through almost every episode. Well worth checking out! Also, if you watch Veep – Richard is one of the main characters. And he is just as awesome in this as Veep. Baby Driver – I’ve got some seriously mixed feelings about this movie. It had a lot of potential given Kevin Spacey was in it (and Jamie Foxx, and Jon Hamm). But it turned out to be more of a soppy love story than an action movie! And I normally love soppy love stories but I didn’t love this! The driving scenes were the best part. Who else has seen it? Did you love it or hate it? Nothing – I need good podcast recommendations so please send them my way!!! My favourite is My Favourite Murder but I’ve listened to heaps of other true crime ones and nothing has really grabbed me! Option B by Sheryl Sandberg – I LOVED this book! I seriously love Sheryl and this is just as good as Lean In, albeit a little sadder and more confronting. If you don’t know her story, her husband passed away suddenly a few years back when he was only in his 40’s. Sheryl tells her story but also weaves in those of others in teaching us how to tackle adversity and build resilience. Great read! The Call of the Weird by Louis Theroux – I’ve always been such a huge Louis Theroux fan that I’m not quite sure how this book went unnoticed by me for so long! Years after his Weird Weekends series he decides to ditch the cameras and travel back to reinterview the subjects of his documentaries to see where they are now. Fascinating and also stamped with Louis’s sense of humour. HAVE A HAPPY AND HEALTHY AUGUST EVERYONE! I have been working so much I haven’t had much time to myself but that smoothie sounds delicious and I could use a pampering mask! Hope you can get some time to yourself soon Aimee! I totally needed something new to watch and had never heard of either of those. Adding to the list! I haven’t seen Ozark or Baby Driver yet. But they are on my list. I have heard lots of good things. Ive been watching old shows on Netflix as I’ve been on a 90s-2000s show binge. But my mom watched OZark and loved it. Maybe I’ll check it out next. Yeh they do have some great older shows on there! Girl I used to drink smoothies everyday faithfully. I’ve taken a long break from that but they’re so delish! Option B sounds like an inspiring book and I’d love to read that someday soon when I have the time. I love books that tells about the author or someone else’s experience while teaching us lessons along the way. It is perfect for that! I have always wanted to go to the Ozarks! Loved this post!! I’m looking for new books to read. I’m going to check those ones out! I was considering starting Ozark just today and I think you’ve pushed me over the edge. As soon as I’m done with Gypsy, that’s next. I completely relate to your comments in the eating section, we were going overboard on groceries for extravagant meals, and decided summer would be about eating from the fridge as much as possible, with local fruits/veggies being priority. Great job! I have heard so many mixed reviews of Baby driver. I really wasn’t sure what to think about it when I saw it. I know that it’s chase scenes and other action sequences but it seems to be more focused on the dramatic aspects. I will probably see it but when it comes out on video. Yeh it’d be alright to watch on video! We LOVED Ozarks! We drilled through the show in a few days. I didn’t realize that Sheryl Sandberg had a new book out. I loved Lean In. I’ll have to see if it’s on my kindle unlimited. It was definitely binge worthy! Thanks for the book recommendations! I wish I could have gotten more summer reading in but it really has flown by. I can’t believe we’re in August already! Oh I see, Ozark is pretty nice and interests me. I am definitely looking forward reading more articles from you due to this. Thanks! Ozark sounds interesting, Jason Bateman is one cool guy! I think I’ll have a look at “The Call of the Weird” and hope that is going to be weird enough for my taste! I will have to check out Ozark and start watching it with my boyfriend. oh my…we could be best friends lol This is totally me right now. That Berry Green Smoothie sounds delicious!! I have also been really into clay masks and pink clay soaps, so gentle! I haven’t tried pink clay soaps – sounds very interesting! I have been watching reruns of Sabrina the Teenage Witch with my kiddos. I have been reading some books about the history of Christmas. Thanks for the recommendations. I have been thinking about watching Ozark , now its on my list! It’s a great one Anne! I’ve heard great things about Ozarks and Detroiters. I keep meaning to watch both. They might have to wait till after I finish Wet Hot American Summer 10 years later. That clay mask sounds interesting, it’s good to find a product that works so well with your skin. Is Ozark okay so far? I’d love to watch Baby Driver! I have been wanting to watch The Ozarks. I’m liking the Homecoming podcast. They just started season 2. I haven’t heard of that one – interested to give it a go! that’s alot of moving I can understand, my friend just moved into a new house on the 31st and they are now still unpacking 2 days later. also I can agree when I binge watch a series I really like it’s the pits waiting for the new seson to start! I’m stiil waiting for a series I was watching to start the new season 2 months now i think i may need to give up but i really cant seem to. it was really good! Moving is certainly painful!! As is waiting for series to come out!! I have heard of Ozark but haven’t tuned in to watch it yet. I’ve seen mixed reviews about Baby Driver too. One trailer of the driving from the cops looked awesome! Yeh the driving scenes were really fantastic! Loving that Berry Smoothie recipe. I’m working on adding variations for the kids with back to school quickly approaching. Oh thanks so much Tomika! Hope the kids are enjoying! I need to remember I can make smoothies with my fruit that seems to pile up! And YES about Ozark! I was riveted from the moment I started. So good! It’s such a good way to use up fruit! I love a really great clay mask, maybe I should check this one out. I love berry green smoothies! They are so yummy, and I love getting in my greens in a yummy smoothie. It’s such a good way to get greens in! I’ve been looking for some new TV shows to watch. I’ll have to try those out! Definitely give them a go Nancy! I just added Ozark to our queue last night. It does look interesting. And Amazon just recommended The Call of the Weird to me this morning. We’ve been watching Game of Thrones, Dark Matter, and sci-fi’s. But I’ve been reading the complete collection of Arthur Conan Doyle. I haven’t heard of Dark Matter – will have to check it out! OK I think I need to try out that mask, I do still suffer from acne so anything that could help I am all for. Yeh I’m open to anything that will help!! Great to know what you are into or not for future reference. I love your Netflix choice. Will need to check out Detroiters when I get a chance. I wonder if it just appealed to our sense of humours or if other people will enjoy it! That green berry smoothie sounds awesome. I usually make mine with bananas and apples, but this sounds like an awesome way to mix things up. I’ve never put an apple in my smoothie so I’m interested in trying that now! I need to check out these shows! We just wrapped up Life Below Zero and need something else to watch. Adding to our list! Yeh it’s the perfect mixture for a couple for sure! I know what you mean when you say you can’t taste the greens in a smoothie. I often make them and I absolutely love them. Folks just have to try it to believe that green smoothies don;t taste bad at all. Exactly – to look at them they sure aren’t that appealing! Ohhh Ozark. I have heard some great things about it from some coworkers. I need to jump on the bandwagon I guess. Thanks for sharing the clay mask product. I have been searching for something gentle that does not trigger acne. Looks like you might have hit gold. We are on episode 5 of Ozark. We live in Missouri and cringe at the stereotypes (honestly, I have never seen anyone like the people cast for this show) but we are riveted to the storyline. Jason Bateman is killing it! Haha I was kind of wondering that Terri!! You are right – Jason Bateman is great in it! That is a quiet month for you Cassie… you forgot to mention how much support you have given family! Being the backbone is soooo time consuming..
My Dad has a condo there where they filmed Ozark here in Missouri. It’s where we vacationed growing up on the Lake. BTW – need the scoop on the mask! Oh my gosh that would be amazing! Every time they do an aerial shot of the Ozarks I can’t believe how beautiful and tranquil it is!! Haha that’s like my partner and Game of Thrones – it’s not my thing!